What a cutie Sylvie. Lovely papers and colours. Your day sounded so wonderful. Oh to go around Europe on a train and seeing the sights. 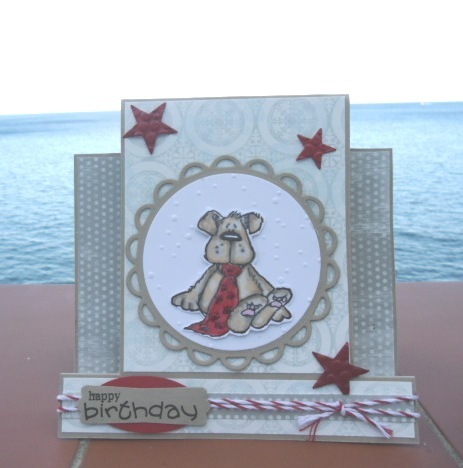 Your card is just as cute as it can be - wonderful! Here at last .. .. and what a busy lady you have been!!! Loving your sewing machine card and this one is super cute too. You won't believe this but I have this stamp too LOL!!! Great shaped card and love the colour combo too. Sorry I have been a bit of a stranger .. .. and that I haven't scanned those photographs yet :-( It's true .. .. I am rubbish!! LOL!! We have had sunshine this week .. .. but the forecast is rain again next. Hope this hasn't been our summer! !